This year’s musical has been announced and Miss Nolan chose: The Little Mermaid from Disney! Ariel, the heroine of our story, is a little mermaid who longs to be human. Cast a strong singer and dynamic performer in this role. Ariel has some beautiful solos but must be able to convey meaning through gesture once she loses her voice. Prince Eric is the adventurous prince who captures Ariel’s heart. Look for a charming performer with a sensitive nature. Prince Eric has a few small solos, but it is more important to cast a strong actor in this role. 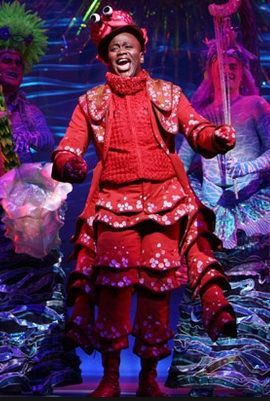 Sebastian is the meticulous and anxious crab who tries to keep Ariel safe while getting to lead some of the most memorable songs in the show! Look for a strong singer who can also handle Sebastian’s emotional range. Sebastian can be played by a boy or girl. Flounder is Ariel’s sincere and sensitive best friend who is loyal to the end. This spunky fish also has a show-stopping solo in “She’s in Love.” Flounder can be cast with a girl or a boy with an unchanged voice. This may be a wonderful role for a younger performer who is ready to take the next step into the spotlight. 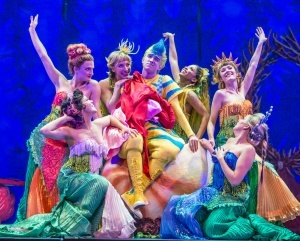 KING TRITON rules the sea and is a force to be reckoned with. This non-singer needs to command the stage as a strong leader but also show the tenderness of a parent. Cast a mature performer who feels comfortable playing father to Ariel and the Mersisters. The Mersisters (Aquata, Andrina, Arista, Atina, Adella, Allana) are Ariel’s siblings and full of personality and sass. These are great roles to showcase talented singers and dancers who can create and play six distinctive characters. 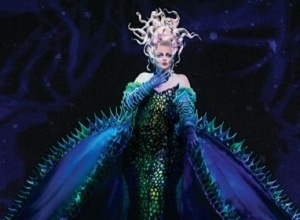 Ursula is the manipulative sea witch who tries to overthrow King Triton. She is cunning and devious and will stop at nothing to get what she wants. Cast a mature performer who can bring out this villain’s humor while finding texture in Ursula’s complexity. Ursula’s songs can be challenging, so look for a singer who will feel comfortable with these solos. The Tentacles are extensions of Ursula, perhaps the poor unfortunate souls who are now trapped in her lair. Look for six or eight performers who work well together and can move as a unit. Flotsam and Jetsam are Ursula’s slippery spies. These electric eels are sinister and sneaky, so look for performers who can be underhanded and devious while still being heard on stage. 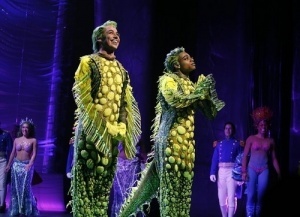 Flotsam and Jetsam can be played by boys or girls. Scuttle is the know-it-all seagull who serves as Ariel’s expert on humans. He is funny and off-beat. While a good singer will rock “Human Stuff,” this song can easily be spoken in rhythm. 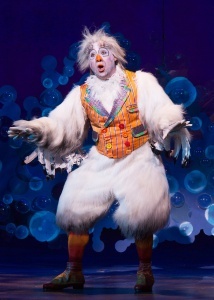 Look for a performer with good comedic timing who is willing to have fun with Scuttle’s eccentricities. The Gulls are Scuttle’s flock of zany “back-up singers” who help explain human stuff to Ariel. While there are three principal gulls written in the score, feel free to add as many as you need to best serve your production. The Gulls’ solos can be spoken if necessary. Grimsby is Prince Eric’s prim and proper valet. He is rigid in personality and constantly trying to guide Prince Eric towards the throne. While Grimsby does have some singing to do, strong acting trumps singing ability for this role. Chef Louis is the over-the-top head chef in the palace. He is always wild and frenetic. This is an excellent featured role for a comedic performer. The Chefs are Chef Louis’s assistants. The music in “Les Poissons” can be challenging, so good choral singers are a plus for this group. 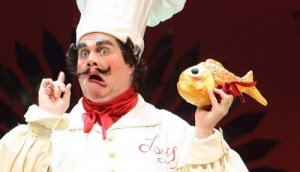 Your Chefs can also double as members of the Sea Chorus. Carlotta is the headmistress in Prince Eric’s palace and Ariel’s greatest human ally. 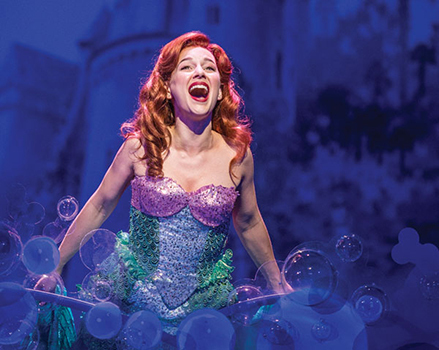 This non-singing role needs to be warm and maternal to make Ariel feel welcome. The six Princesses try everything they can to win the heart of Prince Eric. Since none of them possesses the voice Prince Eric is searching for, cast actresses who can create an exaggerated and comedic personality through song. The six Princesses can double as the six Mersisters. The Pilot is the head sailor on Prince Eric’s ship. This nautical expert who entertains the sailors with wild tales of the sea presents an opportunity to highlight a developing performer. The Pilot has a few speaking lines, but his singing voice is most important. The Sailors are the crew of Prince Eric’s ship. They are eager for adventure and ready to tackle a storm. The Sailors can be played by boys or girls and can double as Sea Chorus. Next Post:What is Florida State Jr. Thespians?